Interested in learning what is a nurse practitioner, and pursuing such a career path? You are not alone. It is a fast-growing occupation that is rising to meet the needs of an aging population and healthcare reform in the United States, with salaries to match the demand and no lack of opportunities for continuing education, professional development, and advancement. Above all, working as a nurse practitioner is truly rewarding. The years of schooling, long hours, emotionally draining days are well worth the knowledge that you made an impact on the health and lives of others. A nurse practitioner is a licensed, autonomous clinician focused on preventing disease and managing people’s health conditions. Nurse practitioners are advanced practice registered nurses (APRNs), meaning they are authorized to carry out more responsibilities, such as making diagnoses, than registered nurses. The role of the nurse practitioner is relatively new to the world of medicine. According to the American Association of Nurse Practitioners (AANP), the first nurse practitioner program was developed in 1965 at the University of Colorado by Dr. Loretta Ford and Dr. Henry Silver. Other colleges and universities, including Boston College, developed their own nurse practitioner programs in the years that followed, establishing a new path for those interested in nursing careers to follow. Since 1965, the AANP – and the role of the nurse practitioner itself – have made a mark on the healthcare industry. A 1994 article by Mary O. Mundinger, former dean of Columbia University’s School of Nursing, published in the New England Journal of Medicine laid out the positives of advanced practice nursing, supporting the role of the nurse practitioner as a cost-effective and quality healthcare provider. In 2001, AANP enlisted the aid of hundreds of nurse practitioners to assist in the aftermath of the 9/11 terrorist attacks in New York City and Washington. Three years later, Congress formally recognized National Nurse Practitioner Week (held annually in November) in a proclamation. Later, AANP and nurse practitioners played a role in the development of the Obama Administration’s Health Care Reform legislation, reviewing the law’s primary care perspective on access, preventive care, payment, quality of care, coordination of care, and the need to include all primary care providers as solutions to the country’s health care crisis. Today, there are more than 248,000 nurse practitioners in the United States. According to AANP, Americans make more than 1.02 billion visits to nurse practitioners each year. A nurse practitioner’s duties will vary depending on his or her specialty. As an advanced practice registered nurse, the role generally involves giving primary, acute, and specialty healthcare services to various populations. Not unlike physicians, nurse practitioners can examine patients, diagnose illnesses, provide treatment, and prescribe medications. In fact, nurse practitioners have what’s called “full practice authority” in 20 states, meaning they do not have work under a doctor’s supervision, according to the online hospital review community Nurse.org. (In the other states, nurse practitioners must have a doctor sign off on certain patient care decisions, though they still have more authority in providing care than registered nurses). Write prescriptions for medications, including frequency and dosage (nurse practitioners hold prescriptive privileges in all 50 states). Conduct or order diagnostic tests, such as x-rays. Diagnose and treat injuries, illnesses, and infections. Record and examine a patient’s medical history, symptoms and previous diagnoses. Talk to patients about managing their health, assist in designing treatment plans, and make recommendations for further care as needed. Provide guidance on medications and their possible side effects to patients. Given the authority a nurse practitioner retains and their advanced education, experience, and training, the role is integral to providing quality healthcare across the spectrum of the population. Nurse practitioners are quickly becoming the “health partner of choice” to millions of Americans, AANP states, as they bring a comprehensive perspective and personal touch to health care. Credibility – For many, nurse practitioners are more than just healthcare providers. They act as mentors, researchers, administrators, and educators. Lower healthcare costs – In offering high quality care and guidance, nurse practitioners help patients lower their overall healthcare costs. Patients who regularly see a primary care provider like a nurse practitioner tend to have fewer emergency room visits, shorter hospital stays, and lower medication costs. Primary care shortage solution – With 248,000 nurse practitioners providing cost-effective, patient-centered healthcare in the US today, the position is an answer to the country’s shortage of conventional primary care providers. What is a Nurse Practitioner vs. Other Medical Roles? 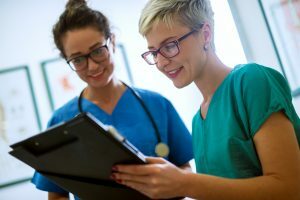 When considering what is a nurse practitioner, there may be confusion surrounding the difference between a nurse practitioner and other healthcare roles, such as a registered nurse, a physician assistant, and a primary care doctor. Learn what sets the role of a nurse practitioner apart from these other important medical positions. What is the difference between a nurse practitioner and a registered nurse? Anyone who hopes to become a nurse practitioner must first serve and gain experience as a registered nurse, or RN. A nurse practitioner is essentially an RN with advanced schooling, experience, and additional authority to administer care without the supervision of a doctor. In addition to advanced schooling (all nurse practitioners must have at least a master’s degree, and many pursue doctorate degrees), nurse practitioners are required to have hundreds of hours of clinical practice and obtain certification (and get recertified every five years). Another difference between RNs and nurse practitioners is that approximately 60 percent of RNs work in hospital settings, while just about half of nurse practitioners work in private practices and community health clinics, according to information provided by Jacksonville University. Both the role of nurse practitioner and physician assistant require advanced degrees, plenty of experience; and both provide direct patient care with more autonomy than some other healthcare roles. In recent years, that independence has increased for both positions as many states have eased requirements for physician oversight, according to Nurse Journal. While both roles tend to serve a common purpose – providing primary care to diverse populations – there are some differences. For example, nurse practitioners are trained in accordance to the nursing model; physician assistants receive training that is more in line with the medical model. Nurse practitioners offer patient-centered care; physician assistants provide disease-centered care. What is the difference between a nurse practitioner and a physician? “Doctors are formally trained in medicine, meaning the treatment of disease through medication, medical procedure and sometimes surgery. They differ most in the time spent on education and the types of patients they usually see. Physicians spend more time in school, and spend more time studying disease. They often specialize in one area or specialty and make a career of diagnosing and treating that illness or condition. While nurse practitioners must also have advanced education, they log many hours doing supervised clinical work. Nurse practitioners also may choose specialites, and can often step in as a primary care provider since their backgrounds encompass risk identification and preventative care. What is a Nurse Practitioner Salary and Career Outlook? The future is bright for those interested in a career as a nurse practitioner. As the population ages and the need for quality healthcare rises, so too does the demand for qualified nurse practitioners. The Bureau of Labor Statistics projects APRN jobs (nurse practitioners, nurse midwives, and nurse anesthetists) to increase by 31 percent by 2026, which is much faster than most occupations. The average salary for APRN positions is $110,930, out-earning registered nurses by more than $40,000 (the average annual salary for a registered nurse is $70,000). Nurse practitioners can also add specializations, often leading to higher salaries. What Makes a Good Nurse Practitioner? When discovering what is a nurse practitioner – the role, the duties – it is important to also consider the characteristics, skills and traits that make someone a good nurse practitioner. Ability to Think Critically – Nurse practitioners must be able to consider patient desires, medical history and available resources to come up with the right treatment plans. Communicative – Nurse practitioners must be able to engage effectively with patients, their family members, doctors, colleagues and more on a daily basis – and learn to adapt and collaborate with people from various backgrounds to produce the best possible outcomes for patients. Compassionate – Compassion is the foundation of all nursing. Nurse practitioners must acknowledge their patients’ discomfort and illness, gently reassure worried family members, and assist the elderly, very young, or disabled patients communicate their needs. Emotionally Stable – Emotionally draining days and fear, worry and grief are part of the job. Nurse practitioners must maintain healthy boundaries between themselves and their patients (and their patients’ families), always maintaining professionalism in the face of personal reactions. Healthy – It is not only important for nurse practitioners to practice what they preach to patients, but the job itself is physically demanding and often requires hours on your feet, lifting patients, and managing heavy equipment. Keeping up with a healthy style and staying in shape are integral to a successful career as a nurse practitioner. Observant – Nurse practitioners must be adept at active listening and have strong observational skills to zero in on problems quickly. Picking up on visual cues – like sweating or an obvious change in respiration – helps when patients have trouble articulating their ailments. Organized and Attentive to Detail – Nurse practitioners may see many patients a day and have little time to regroup, so it is important to be organized and attentive in order to be an effective health care provider (not to mention keeping accurate medical records for patients, paying attention to prescription dosages and details, and complying with privacy laws ). Self-Confident – With little physician oversight comes great responsibility. A nurse practitioner must feel confident in his or her ability to effectively diagnose and treat patients. 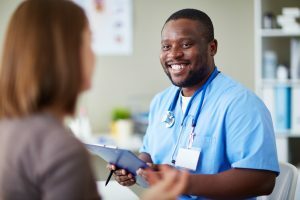 If discovering the answer to “What is a nurse practitioner?” has convinced you to pursue the position, learn what you need to do. From there, a prospective nurse practitioner must enroll in a program to earn a Master of Science in Nursing (MSN). MSN programs are intensive and usually take at least two years to complete. Be prepared for in-depth courses covering pharmacology, anatomy, and other nurse-specific subject areas, plus clinical rotation hours. Once the MSN program is complete, prospective nurse practitioners must earn an advanced practice nursing licensure in practical nursing (exam and certification requirements vary from state to state). 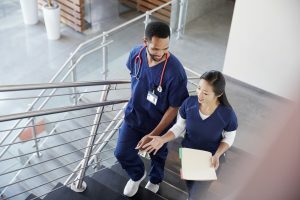 Finally, work as a nurse practitioner can begin – but expect to continue learning and undergo continuous professional development to maintain clinical competency. Acute Care Nurse Practitioner – Acute care nurse practitioners are focused on getting patients the stabilizing they care they need during and after a medical emergency, accident, illness. This specialization tends to be divided into two subfields, adult and pediatric. Acute care nurse practitioners tend to work in hospitals, birthing centers, urgent care clinics, and rehabilitation facilities. Gerontological Nurse Practitioner – Gerontological nurse practitioners provide acute and/or primary patient-centered care for the aging population in a variety of settings. Family Nurse Practitioner – The most popular of specializations, family nurse practitioners focus on health promotion and disease prevention for patients of varied ages and medical histories, in a variety of settings. Neonatal Nurse Practitioner – Neonatal nurse practitioners care for infants with a variety of health problems, including birth defects, prematurity, chronic illnesses, and other health issues. Pediatric Nurse Practitioner – Pediatric nurse practitioners provide primary and/or acute care to children, covering a wide range of medical services like routine physical exams and immunizations, designing treatment plans for illnesses, and educating children and parents on concerns like nutrition and obesity. Psychiatric Mental Health Nurse Practitioner – Psychiatric mental health nurse practitioners perform clinical work with patients who suffer from psychiatric disorders or mental illnesses. They work in settings like community health centers, public policy organizations, and mental health facilities. Women’s Health Nurse Practitioner – Women’s health nurse practitioners focus on the sexual, reproductive, and menopausal health of women and work in settings like family planning clinics, infertility clinics, women’s health clinics, assisted living programs, and more. Whether you are looking to land your first job as a nurse practitioner or looking for a change, search nurse practitioner job listings on Provider Matching, an intelligent job board serving the Physician Assistant and Nurse Practitioner communities.